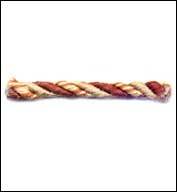 3/16" acetate and cotton twisted cord from our Princess Mingled Collection sold by the yard. The style has been discontinued. We still have 1 bolt of color PR12. Please do a search for item 8641-36 in the upper left corner of the site to get to that item. If you are interested in one of the colors by the bolt shown in the color chart, please contact us, we may be able to get it by the roll. Please reference the color chart link at the bottom of the page.